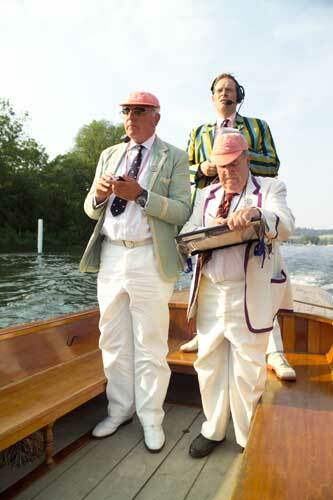 The National Rowing Foundation's Executive Director, Hart Perry, (on the left) has for many years been the only American Steward of the Henley Royal Regatta; actually, he was the first non-British Commonwealth citizen to be elected a Steward. 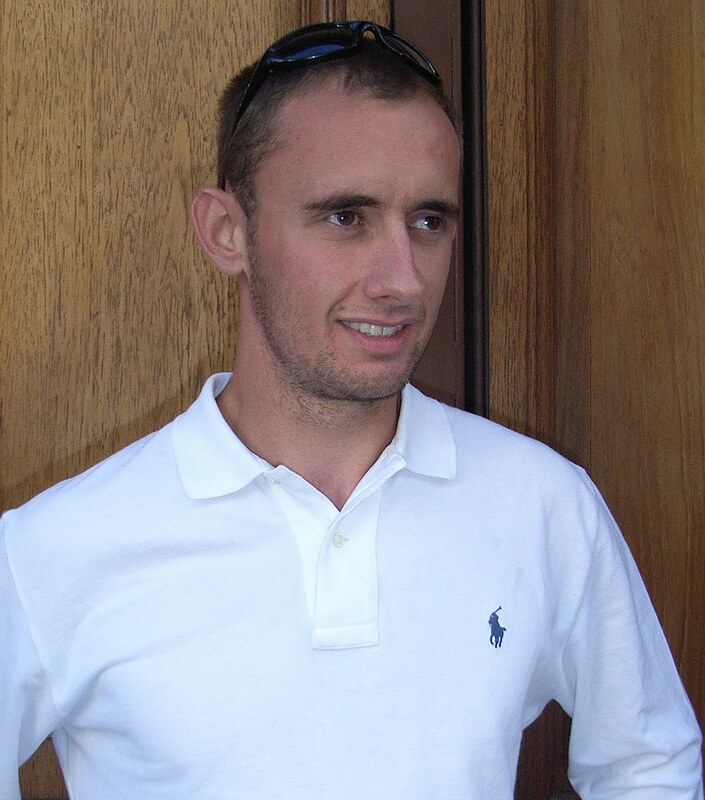 Tim Koch, HTBS's special correspondent in London, pointed out to me in an e-mail the other day, that the Stewards now have a second American who has joined their ranks, Jamie W. Koven. In a press release from HRR, on 10 December 2009, it states that "Jamie Koven is 36 years old. He was educated at St. Paul's School, Massachusetts and Brown University, Rhode Island. He is a Partner and Managing Director in One Equity, the private equity arm of JPMorgan Chase Bank and lives in New York. Jamie is a double Olympian, a World Champion both in the eight and as a single sculler and a multiple winner at Henley." The good Tim writes, "The Stewards do not point this out but the row2k website have a picture of Koven and friends in their underwear." If you would like to have a look at a Henley Steward in his underwear, then please click here. I have to confess that I find it confusing that with the very strict dress code at the Stewards' Enclosure and so on, a Henley Steward would allowed himself to be depicted in his underwear. Of course it is new times and Koven is, after all, an American, but we are talking about the Henley Royal Regatta here, and... ahh, well I guess I am just too old-fashioned... Below is a photograph of correctly dressed Umpires at Henley. “…I derived the utmost joy from my rowing. Not in any masochistic sense but in so many positive ways. The assuaging of a burning thirst; the satisfying of a giant appetite; the comfortable tiredness that presages a good night’s sleep; the camaraderie of friends all set on the same objective. These things I loved. Then there was the wonderful feeling of fitness, the unleashing of a strength that seemed boundless, and those wonderful days when the crew’s improved technique brought a glorious response in the run and pace of the boat…Those were moments that brought such rich rewards. Sometimes it would seem almost as though the boat were a live thing which with its own particular brand of joi de vivre, was joining in the frolic by skidding through the water of its own accord. 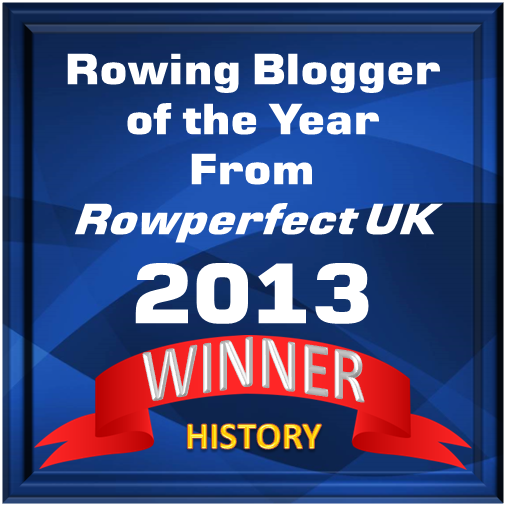 Merely to glimpse these delights is something that makes rowing so very, very worthwhile”. I am sure that anyone who has ever put any time and effort into rowing and has ‘glimpsed these delights’ will agree with Gully’s words, Tim writes. 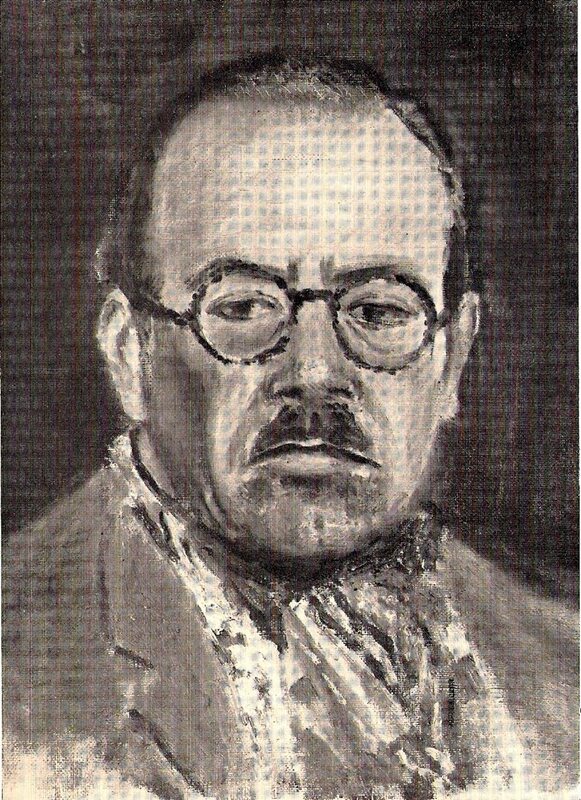 Footnote: The frontispiece in Rainbow shows a self-portrait of Gully Nickalls from c. 1935 (seen above). He called it 'Disagreeable Me'. Rowing historian Bill Lanouette, expert on professional rowing, sent me an e-mail with greetings from Toronto, where he is on business. “I couldn’t resist a ferry ride to Hanlan’s Point,” he writes. 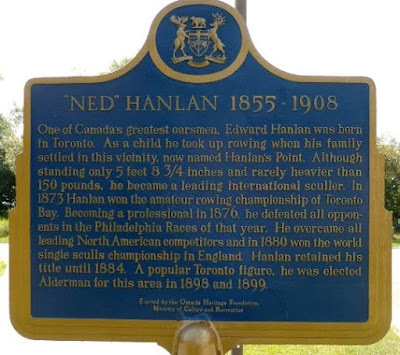 About Toronto’s great son and the statue erected to honour him, Bill points me in the directions of a web site, which states: “Raised on the Toronto Islands, Ned Hanlan [1855-1908] became a World Champion sculler in 1880. He is one of Canada’s most loved sports heroes of all time. To honour his achievements, the City of Toronto erected a monument to Ned Hanlan carved by famed sculptor Emanuel Hahn in 1926. 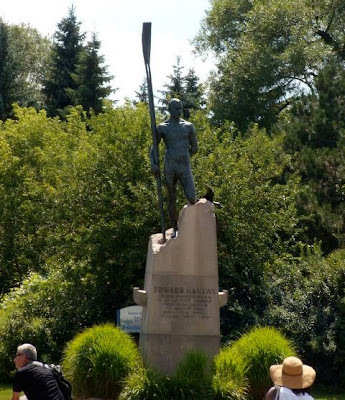 Formerly on the grounds of the Canadian National Exhibition, this monument has been relocated to the site that bears his family name.” Hanlan’s Point is where Ned’s father had a hotel. Read more here. Lovely photographs, Bill – thank you very much, indeed! How would it be to train for the 2012 Olympic rowing event in London with gunshots and bombs blasting close by? This is what the Iraqi rowers Haider Rashid and Hamza Hussein are experience almost daily during their training sessions in their double sculls, Andrew North of the BBC writes from Baghdad the other day. Click here to read the article and watch the video. Last weekend, on 17-18 July, the Swedish Rowing Sprint Championships were held in my old hometown of Malmö. The 600-metre course was a straight stretch on the Malmö Canal in the centre of town. As the canal is very narrow and can only take two boats abreast several heats were needed to get to the two finalists in each class. My good, old club, Malmö Roddklubb, was the host, together with the regional rowing federation, Skånes Roddförbund. The event went very smoothly, the weather was great, and all the races were televised by the major Swedish national TV-station. I hope that Swedish rowing will get a real good boost out of all this hoopla. One of the hardest races was in the men’s single scull, lightweight, where Kevin Hermansson (Kungälv RK) met Philippe Romé (Mölndals RK). 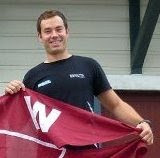 Romé, who is from France and living with his Swedish girlfriend and their daughter in Göteborg, gave everything he had, and a little more, to become the Swedish Champion in the single scull, lightweight. Below you can watch the race. The commentaries are in Swedish, and one of the voices belongs to rowing expert Henrik Nilsson, an old Blue who rowed for Oxford in 1998 and 1999, the only Swede who has competed in The Boat Race up to this date. Following is a short interview in English with Philippe Romé. With reference to today's post on the forthcoming feature film about 'Facebook' and the Winklevoss boys, you may see more rowing in it than the trailer promises. During the lunch break at Henley this year the film makers were allowed to recreate a Harvard - Nereus race of some years ago in which the overachieving brothers were involved. The crowd were urged to cheer as in a real race and were warned that, if they did so, they gave implied consent for their image to be used. To make the best use of their limited time, the film people actually put two 'Harvard' and two 'Nerus' boats afloat. They were not well matched so expect some interesting continuity errors. This, of course, is only of concern to pedants and rowers. Anyone who expects accurate rowing scenes in a film will be disappointed - see the 'Tideway Slug's Guide to Rowing Films'. Mark Zuckerberg, founder of Facebook, announced the other day that Facebook now has an incredible 500,000,000 members. On 1 October this year a film, The Social Network, about the creation of Facebook is going to open at the movie theatres in the States. The twins Cameron and Tyler Winklevoss, who both rowed for the Dark Blues in The Boat Race earlier this spring and were ‘involved’ in the creation of Facebook when they were studying and rowing at Harvard, are also featured in The Social Network. The trailer for the movie has been released and of course it shows a couple of seconds of rowing. It is inevitable that when we talk about sport personalities, it is the great stars we mostly bring up, or those who maybe did not make it to the top, but there are some good stories to tell about them because they were real characters. 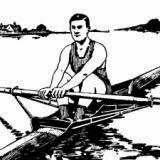 In professional rowing we could for example mention the Biglins, Ned Hanlan, Charles Courtney, Ned Trickett, James Renforth, Harry Clasper, William Beach, Jim Stanbury, Richard Arnst, Ernest Berry, Ted Phelps, and Bobby Pearce. I am guessing that the sculler in the picture above probably would not make the list. 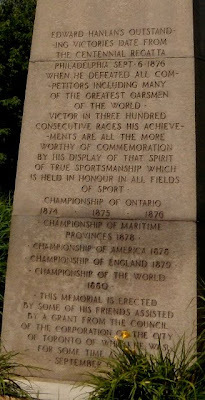 He trained the New Zealander Tom Sullivan when he had challenged George Bubear for the sculling championships of England, which Sullivan won in September 1893. Thereafter, he, himself, challenged Sullivan for the championship title. They sculled for the title in February 1895, and Sullivan lost the title to his trainer. 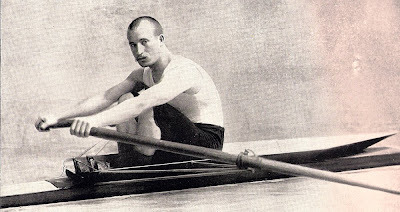 In July 1896, he challenged the Australian Jim Stanbury for the Sculling World Championships, but Stanbury defended his title and won the wager of 200 pounds. Being aware of the copyright issues, I do not dare to publish the cartoon, “He’s working from home today”, which is made by artist John Klossner, but I can always link to it. See the cartoon by clicking here. Earlier today, I received a very nice e-mail from Jim Buckley, who is working in Washington, on the American west coast. Among other things, he writes: "We are building Classic Cedar Singles in Port Townsend, WA in the Pocock tradition, Stan Pocock having given us his machines and stock after the Pocock Co. stopped building cedar singles in 2002." I had a look at their website, which gives you the complete story of the Pococks and how Classic Cedar Singles now is continuing the Pococks' legacy. A lot of great stuff and some very interesting rowing history links. Go and have a look immediately! Wellington Rowing Club is one of the famous rowing club’s in New Zealand. It was founded 125 years ago and earlier this spring the club published a jubilee book by one of its members, Michael Grace, to celebrate this event. I have previous written about this book, The Dolly Varden Legacy, (see entry on 27 May), but at that time I did not have the book in my hand. But now, here it is on my desk, a beautiful, well-written book with tons of interesting facts (also for those who have no connections to Wellington RC or New Zealand) and illustrated with some marvellous black & white photographs. The book title is from a boat, the Dolly Varden, which successfully was used by some oarsmen in races in Wellington before the Wellington RC was even founded. What I especially appreciate in The Dolly Varden Legacy: The History of the Wellington Rowing Club is the way Michael Grace (on the right) has manage to balance the club facts, results, etc. 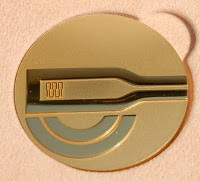 (that truly might only interest members of the club), with international rowers and events. 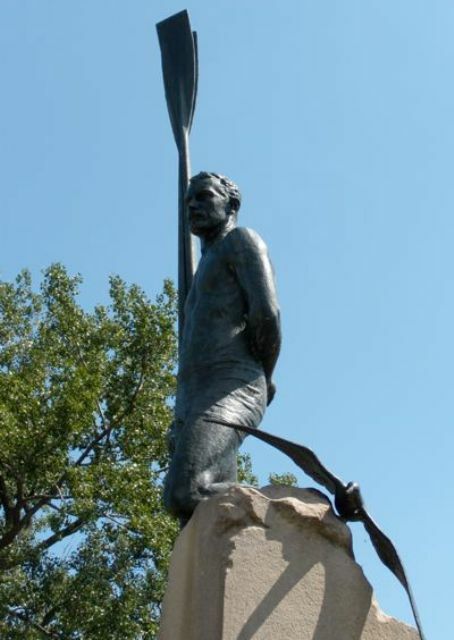 To give you a couple of examples of the latter: Tom Sullivan, famous professional sculler and later coach, was a member of the club, and in the book he is given a whole chapter; the Maadi Camp Rowing Club founded by members of the 2nd New Zealand Expeditionary Force in Cairo in 1940. The Maadi Camp lives on in the Maadi Cup, which is a prize for the New Zealand secondary schools boys’ eights. Wellington RC is to be congratulated for its first 125 years, and Michael Grace is to be praised for his hard work creating such a wonderful book. 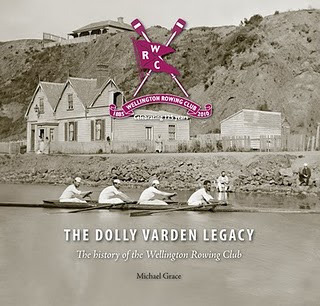 The Dolly Varden Legacy can be ordered from the Wellington RC website by clicking here. Guest writer Anthony is here giving the HTBS readers a real treat. Tony went on a marathon row in a ‘church boat’ earlier this month at the town of Sulkava in Finland. Here is his report! Summer in many nations is a time of pilgrimage, and in a somewhat modest way the same can be said for Finland. At least judging by the absence of shoppers in the malls or the lack of jams on the Helsinki ring roads, vast numbers have escaped the cities. It’s obvious that summer cabins are the greatest attraction for most families, and concert venues for most young singles. 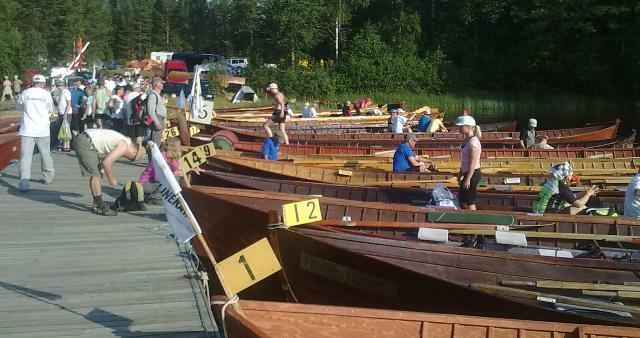 But from July 8 to11 in Sulkava near Finland’s eastern border round 7,000 rowers take to the water in a festival of wooden boats. Along with the Finnish hobby of wife-carrying racing, this is the largest participatory sports event that the country has to offer during the summer months, and the greatest number of those involved were in traditional 14-oared, 12 meter long, wooden ‘churchboats’. As you might expect these used to have a highly utilitarian purpose: getting people from outlying homesteads back behind the forestline to church, in those quieter days before paved roads and carriages, let alone engines or speedboats. 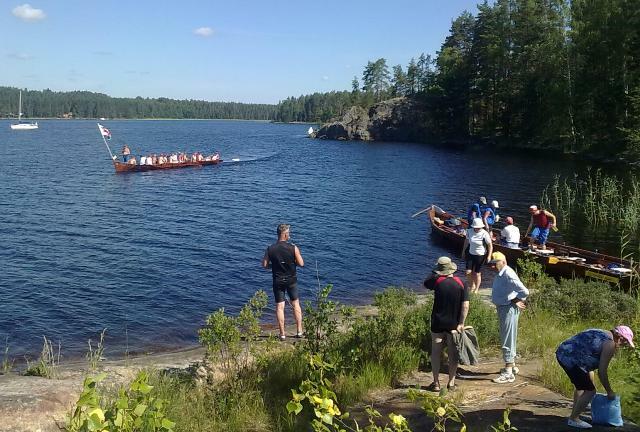 Known in Canada as ‘Viking boats’ with their traditional, sleek wooden lines, the craft could be over 20 meters long and were built almost exclusively of pine, clinker style with six strakes. They were constructed and rowed locally, involving both men and women at the oars, with the largest known to have had 60 rowers. Whereas in days gone by the outward journey would be conducted in quietness or with only sacred singing, the return trip was an opportunity for locals’ racing spirit, with men even doffing their dark hats and jackets in an atmosphere that was anything but reverential. This is the more spirit which survives in the mass races held in Sulkava. Men and women of all shapes and physiques and from all parts of the country pit themselves against their own physical limits and 60 or 70 kms of lake. The fittest racers come from clubs around the country, managing the journey in under 4 hours, having spent the previous winter months training for the event. Equally important for the health of the sport are the part-time enthusiasts who join the ‘marathon class’. This course is slightly longer and is spread over the whole weekend, with a night under canvas for most participants. It involves little or no specific training, but an equal determination to get to the end of the course in as best style as possible. The crews are often formed of work colleagues, throwing together folks of different wits, aptitudes, let alone sexes. My boat comprised 15 varied souls, the youngest in his late teens, the oldest nearly 70, and after completing the course with experience of previous marathons between 1 and 31 years. In contrast to the disciplined racing boats, there was a constant barrage of banter between these rowers, occasionally moderated by the cox who had a very hands-off attitude. His most important role, other than steering obviously, was to ensure that all crew members stopped to drink, 2 at a time at regular intervals. Longer breaks were spent at the refreshment stations provided, but equally important given the searing temperatures this year were the frequent stops to stretch legs, immerse over-heated bodies, as well as to replenish nicotine levels! This indeed is rowing for pleasure. Tony, many thanks for a great report! 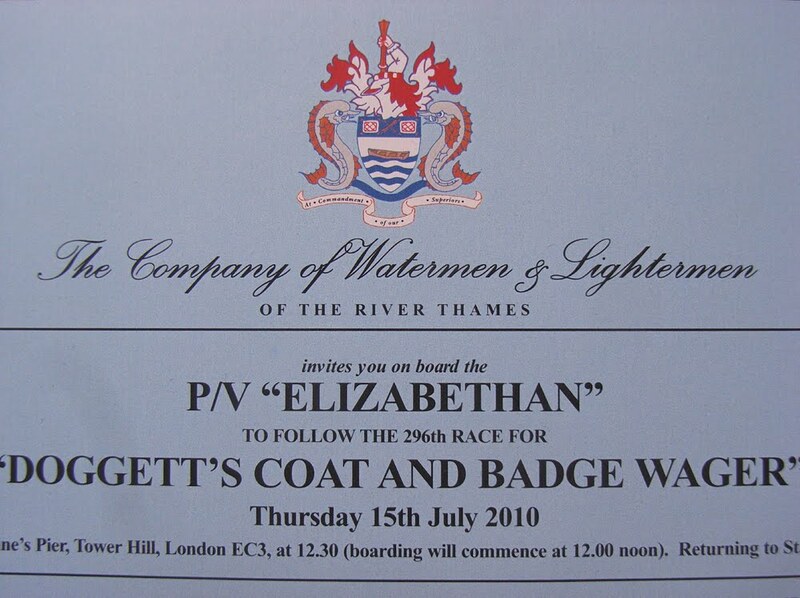 Yesterday, it was time for the annual Thomas Doggett's Coat and Badge Race on the River Thames. HTBS's special correspondent in London, Tim Koch, gives us a report from the river. 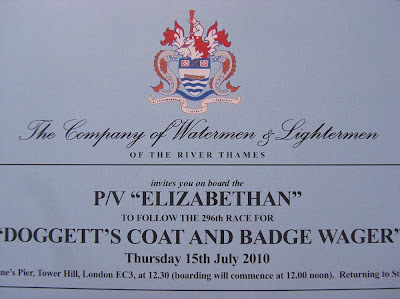 Held every year since 1715, the generally little known Doggett’s Coat and Badge is the oldest rowing event in existence. It was 114 years old when the Oxford – Cambridge Boat Race started in 1829 and 124 years old when Henley Regatta started in 1839. It is one of the oldest continuously held sporting competitions in the word. 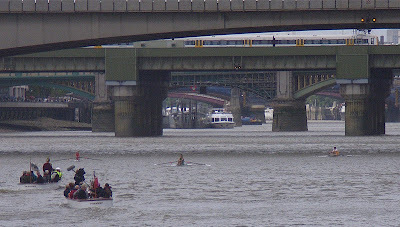 ‘Doggett’s’ is a sculling race of 4.6 miles / 7400 metres, only open to those who have, in the preceding three years, finished their apprenticeship to become Thames Watermen. These ‘Freemen’ are the only people allowed to carry goods and passengers on the river. Strangely, while ‘the Wager’ is only for members of the Company of Watermen and Lightermen, since 1722 the event has actually been run by the Fishmongers’ Company. One theory is that the respectable Fishmongers were considered more suitable to look after Doggett’s legacy than the roguish Watermen. The Coat and Badge was originally a race of heavy passenger carrying wherries sculled against the tide and could take two hours. 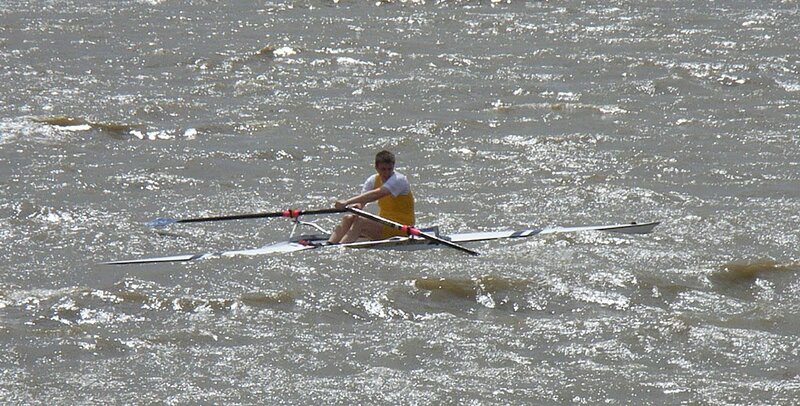 Today it is run with the tide in contemporary sculling boats and the modern record is just over 23 minutes. The winner gets a splendid scarlet coat with a large silver arm badge embossed with an image of the horse of House of Hanover - and the honour of joining a very exclusive group. "They all got off to a good start. I suppose three of them (Arnold, Alloway and Pettipher) were quite well matched. No disrespect to Ruler (seen on the left), the weather was absolutely abominable, a head / cross wind and wind over tide, but the boys did so, so well. Arnold’s Dad had the foresight to change his sculls from cleavers (hatchets) to Macons. It’s not like a straight race…there are bends and (eleven) bridges with buttresses at different angles. When they got to Waterloo Bridge (1.8miles / 2800 metre into the race) Alloway made the mistake of going too wide while Arnold stayed in the stream. This is where he gained many lengths and was able to sit back and watch his competitors. When the water is ‘lumpy’ it is so difficult. Alloway nearly went in about ten times and Pettipher about twenty times. Alloway had a few bad shipwrecks which I think unnerved and, possibly, physically hurt him…. that’s why Pettipher passed him. But they all finished and that’s what it’s all about. It’s no shame to come second or third or fourth. We are on a great river, this is liquid gold steeped in history and it’s wonderful that the Fishmongers’ Company continue to run the event. The final result was Arnold first, Pettipher second, Alloway third and Ruler fourth." "It was tough. I have been following the weather for the last week and it did not look as though it was going to be fun - but everyone had the same problem. You have to be careful out there. All the way through, no matter how much I pushed and how far away I got, there was always the chance that if I had a bad stroke I could have gone in. I did not really race it as I planned; I just managed to make fewer mistakes than other people. In those circumstances it’s difficult to think clearly. I did not lead all the way. Off the start I think I was third but I have had a lot of race experience, I have been rowing since I was young, so I did not panic and got into a good rhythm. I was not going to get dropped. (A slow start) does not matter in a race as long as that… you have to pace yourself. I had confidence in myself and that’s all I needed to help me push on." 1) Arnold 30 min. 25 sec. 2) Pettipher 30 min. 48 sec. 3) Alloway 31 min. 53 sec. 4) Ruler 38 min. 05 sec. In 1715 Thomas Doggett, announced that the race ‘…… will be continued annually……forever’. Thankfully, it looks like it will. I do not like when people dwell on things, but I cannot help bringing up something that I was discussing in my previous entry, the use of the Swedish letters ‘å’, ‘ä’ and ‘ö’. Being busy for weeks, it is just now that I have had the time to go through a pile of magazines that has arrived during the two last months. Flipping through the pages and reading here and there, in The New Yorker, July 5, 2010, I came across a piece by Nora Ephron. She is an American journalist, novelist, and screenwriter (etc. ), and in this issue she is trying to be a humorist, too, as she is writing under the vignette ‘Shouts & Murmurs’, which is the magazine’s ‘fun page’. What Ephron is paraphrasing and joking about is the Swedish writer Stieg Larsson’s popular crime novels about Kalle Blomkvist and Lisbeth Salander. Now, I do not mind anyone making fun about Larsson’s books (and, no, I have not read any of them); I think his relatives will laugh or cry all the way to the bank. But what I do object to is Nora Ephron’s teasing, even mocking, way of the Swedish language’s use of the letters ‘å’, ‘ä’ and ‘ö’. Or, what Ephron thinks are ‘a’s and an ‘o’ with umlauts. Nora Ephron’s “The Girl Who Fixed The Umlaut” is not only a good example of bad taste, it shows arrogance and a typical big-nation's superior attitude towards a smaller nation and something you do not understand, or even try to comprehend (this phenomenon has often previously been seen in American foreign policy). None of the Swedish words Ephron mentions in her article has an umlaut; instead they are geographical places, names of streets and roads, or surnames. So, sorry Nöra Ephrön, your article is not funny, it is only snobbish! I apologise to my readers, this is not an entry on rowing, and in the future I will really try to stay away from non-rowing related subjects! At last, the new edition of The Long Ships by Frans G. Bengtsson is out here in the States. Bengtsson is my favorite Swedish author, and he was a true man of letters; he wrote poems (sonnets as a matter of fact), essays, book reviews, a biography about the Swedish warrior king Charles the XII, and the two-volume novel The Long Ships, which is about the Viking Röde Orm, or as he is called in the English edition, Red Orm. For anyone interested in this book, its author, and its English translator, Michael Meyer, who performed a brilliant translation (trust me, I have read them both, over and over again...), might like to take a look at an entry I posted on 3 May 2009, ‘A Rowing Room With A View’. It sheds some light on my all-time favorite book, which has some rowing in it, too. What is really ‘new’ with this edition, which is published by New York Review Books, is an introduction by Michael Chabon, an author who lives in California. I have to confess that I have not read any of his books, but I am thrilled about what he writes in his introduction. 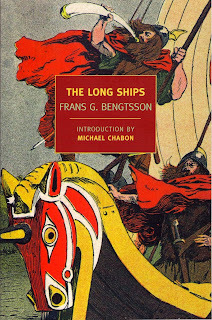 Chabon writes that The Long Ships “stands ready, given the chance, to bring lasting pleasure to every single human being on the face of the earth.” Furthermore, he compares Bengtsson, with all rights, to great authors like Dickens, Stendhal, Tolstoy, and Dumas. Chabon continues to state that the reader of this novel comes to regard its author, “as we come to regard any reliable, capable, and congenial companion in the course of any great novel, adventure, or novel of adventure - as a friend for life.” Is that not beautifully written? I am also happy to read Chabon’s worthy tribute to Michael Meyer for his elegant work with the translation, which actually Bengtsson assisted him with. While Michael Chabon's introduction is superb, I have found some minor ‘errors’ in this edition. First of all, the cover is dreadful! Why on earth are there ‘wings’ on the helmets the Vikings are wearing (‘wings’ are not better than ‘horns’, the latter a terrible historical inaccuracy), and why is there a painted horse or unicorn head in the bow of the Viking boat? 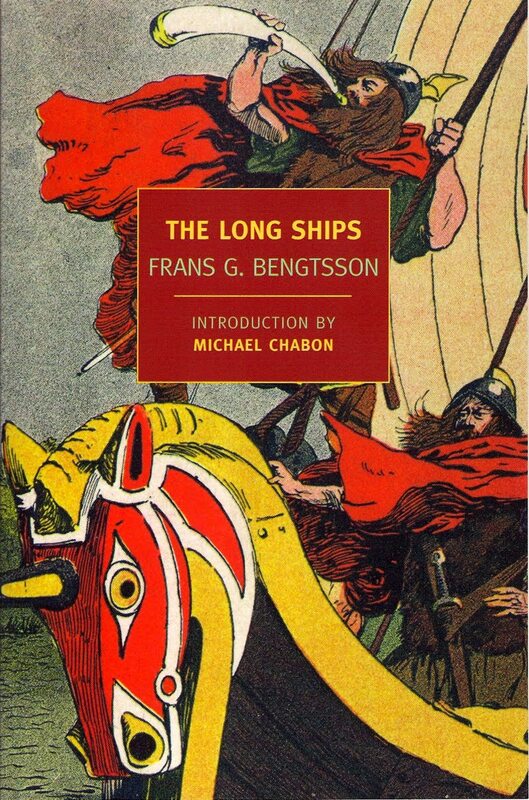 Moreover, in the presentation of Bengtsson in the beginning of the book it states that both the British and the American editions of The Long Ships were published in 1955, which is wrong. They were both published in 1954; Bengtsson was able to see these editions before he died in December 1954. As a matter of fact, I would have handed out some good extra points, if the very first edition in English was mentioned. In 1943, the American publisher Scribner came out with the first volume, with the 'American' title Red Orm. For some unknown reason, the second volume was never even considered by Scribner - their loss! Other ‘errors’ in the presentation of Bengtsson are the Swedish titles of The Long Ships. Here mentioned are Roede Orm, sjofarare i vaesterled and Roede Orm, hemma och i oesterled. The correct titles are Röde Orm, sjöfarare i västerled och Röde Orm, hemma och i österled – nothing else. It is quiet common, on this side of the pond, to disregard the three extra letters at the end of the Swedish alphabet; after the letter ‘z’ follow the letters ‘å’, ‘ä’ and ‘ö’. 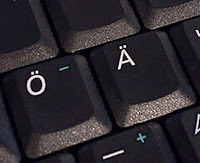 Although it might look as an ‘a’ with a circle or two dots, or an ‘o’ with two dots, the circle and the dots are a part of these letters, and not just merely an ‘umlaut’, though the Swedish language does have these sound changes, too, like man [Eng. man] to män [Eng. men]. At the FISA World Cup rowing regatta in Lucerne today, the committee of The Thomas Keller Medal announced that this year’s winner of this distinguished award was the Australian oarsman, James Tomkins, stroke of the famous Oarsome Foursome. To read more about James Tomkins’s career, go to FISA’s web site by clicking here. Today the third and final round of FISA World Cup rowing was held, now in Lucerne, Switzerland. On FISA’s web site you will find all the finals on video. Go to World Rowing Live by clicking here. The 2010 Parliamentary Boat Race was preceded by a row past by The Company of Watermen and Lightermen. Four Doggett’s Coat and Badge winners rowed the Master and his Senior and Junior Wardens and the Clerk to the Company up to Parliament’s own landing stage. They were steered by the Bargemaster, also a Doggett’s winner. The Doggett’s watermen are (left to right), Nicholas Dwan (winner in 2002), Robert Dwan (2004), Nick Beasley, Bargemaster (2001), Colin Briggs (1967), and Terry Enever (2008). Colin Briggs is related to the Doggett’s winners of 1921 and 1772. The Dwans have the most living Doggett’s winners in one family. The father of Nicholas and Robert, Ken, won in 1971. Their uncle, John, won in 1979. A cousin will race in 2011. Ken Dwan was Britain’s best single sculler in the late 1960s and early 1970s. He represented the country at the European Championships in 1969 (4th place) and 1971 (9th place), at the World Championships in 1970 (9th place), and at the Olympic Games in 1968 (aged 19; 6th place) and 1972 (9th place). He won the Tideway Scullers Head in 1969-1971, and 1973 and the Wingfield Sculls in 1968-1972, and 1975. Yet another interesting entry from Tim – my grateful thanks to him! Thank you, Tim for a nice report! Soon it is time for the FISA World Cup in Lucerne. Follow the World Cup madness by reading Esther Lofgren's blog Lucerne Rowing World Cup 2010. Lofgren, who is a four-time US national team member, has some nice photographs to share. 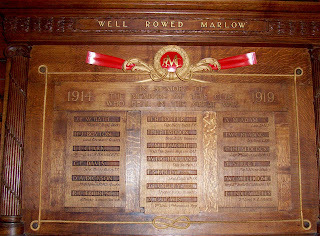 On their annual row from Hammersmith to Henley (as told on 17 June), Auriol Kensington RC’s eight stopped at Marlow Rowing Club for lunch, Tim Koch writes in an e-mail. 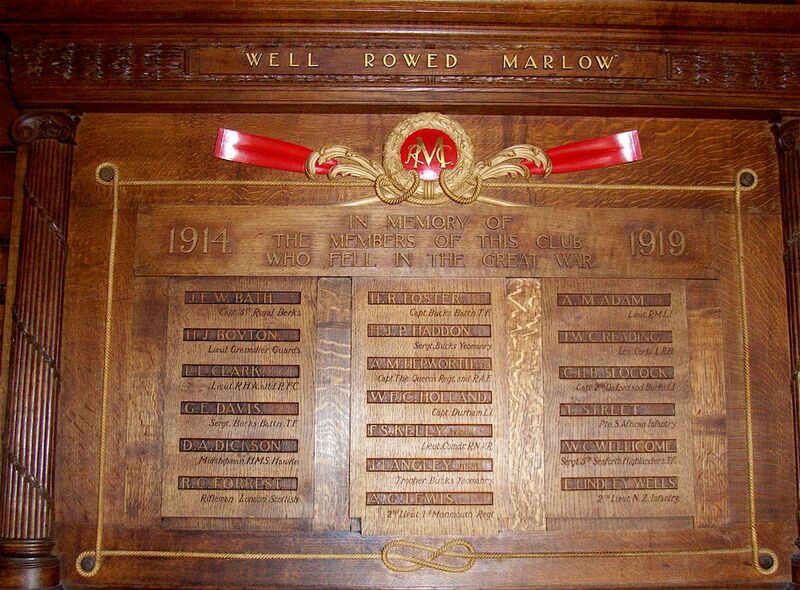 “They have a very fine War Memorial”, which the picture attached is showing. Have you ever heard of the pie eating contest in Houlton, Maine, or the hot pepper eating contest in Round Rock, Texas, or burritos in Coralville, Iowa, and veggie dogs in Austin, Texas, or the hot dog eating contest in New York during Independence Day, July 4th? Neither had I, till I opened up The New York Times Sport Sunday. But let me start from the beginning. My dear wife asked me on Monday evening if I had had a look in The New York Times Sunday sport section if there was anything about the Henley Royal Regatta. My left eye brow probably quivered a bit when I informed her that the mentioned newspaper had dumped its ‘rowing correspondent’ a few years ago, and now never published anything on rowing, it did not matter if it was the World Championships, the FISA World Cup, or the Olympics – no rowing! Well, today I actually took a look and there it was, a report from Henley, or that is, four (4!) long sentences under ‘Sport Briefing’. Above this section was more than a third of a page long article about ‘Competitive Eating’ (and a good sized space on the front of the sport section about this, too). You know, these competitions where you stuff your face with hot dogs, veggie dogs, hot peppers, pie, burritos, or God knows what, and you can win a lot of money. Some of these ‘sport events’ – I take it it is regarded as such as it has all this space in the sport section – are now televised and have, according to the paper, tens of thousands of onlookers who are dying to see if last year’s winner will manage to break his record by swallowing more than last year’s 68 hot dogs in buns in 10 minutes. Disgusting! I can not understand how this gluttony can interest ‘tens of thousands’ of people. To hell with these eating contests, and long live Henley – I will see you there next year! The winners of this year's Henley Royal Regatta. Photographer Hélène Rémond (copyright!). The Diamond Challenge Sculls (M1x): M. Drysdale, West End RC (New Zealand); on the far right is Hart Perry, the first overseas person to join the ranks of the Henley Stewards. The 2010 Henley Royal Regatta is over. Hélène has sent me her fourth and final report. Ecstatically she writes “I have to say the last day has been a wonderful one, unforgettable, full with emotions since Tim Koch invited me to the Stewards’ Enclosure, ‘the inner sanctum’ as he calls it. And as its access is restricted, it was an honour for me to be Tim’s guest and with us was his Polish friend, Eva. Very nice moments, thanks to Tim! It was a unique experience. We went for a tour at the Stewards’ Enclosure. We saw the exhibition of the prizes, different paintings and photographs. Eva tried on a fascinator, a special hat. Of course, the comfort at the Stewards’ Enclosure is superior compared with the Regatta Enclosure. After lunch, we went for a walk towards the Start line, where we met Paul (in a bowler hat), a friend of Tim’s and we followed the tradition, eating strawberries and... drinking a glass of French wine since Paul is very fond of it. After the finals we watched from the Grandstand (where I met these four guys, proudly wearing their school's handsome striped red blazers) the Prize ceremony. and Eva met some Irish oarsmen, too. But everything has to come to an end, also HRR, and when it is time to leave, the course is empty." Many warm thanks to Hélène for nice notes and beautiful photographs from this year’s Henley Royal. A special thank you to Tim, too, as he took good care of a fellow HTBS contributor!